Over time, our skin can feel the effects of sun, aging and cosmetics, as well as other blemishes and imperfections. These can begin to show in various ways, such as lacklustre, saggy, baggy, wrinkly or leathery skin. If you wear skincare products or makeup frequently, you may experience blemishes, clogged pores or other problems as a result. Thankfully, there are techniques out there to give skin that much-needed rejuvenation. At Neutral Bay Laser & Dermatology Clinic, we offer laser treatments to help get your skin to its glowing, radiant best. One of the most effective treatments available for facial rejuvenation at the Neutral Bay Laser & Dermatology Clinic is laser facial resurfacing. This is a procedure which we have been performing at the clinic for many years and one which consistently achieves the highest rate of satisfaction from our patients. 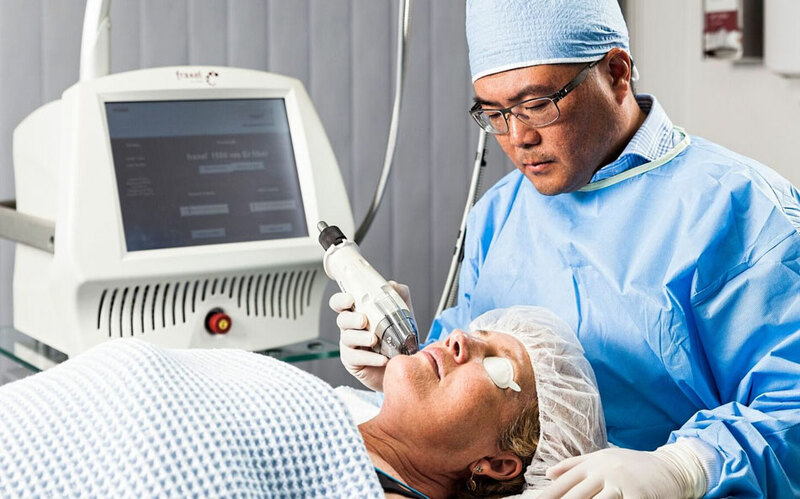 Ablative Carbon Dioxide (CO2) and Erbium: YAG lasers are either used in combination or individually, to precisely remove layers of sun damaged skin from the face and other parts of the body. Thickened, leathery and wrinkled skin is replaced by the body’s own healing mechanisms with fresh, tighter and more evenly pigmented skin. The majority of our patients find that they no longer require the use of makeup. Patients considering this procedure initially, will have their suitability assessed by our dermatologist, followed by a pre-operative consultation with one of our theatre nurses. During this consultation, a step-by-step explanation is provided of the procedure and careful explanation of the requirements for pre- and post-operative care. We recommend that patients are able to schedule approximately one week away from work to allow sufficient post-operative recovery. From cosmetic laser to anti-wrinkle injections, at Neutral Bay Laser & Dermatology Clinic, we’re here as your local skincare clinic. We serve as a professional laser clinic in Neutral Bay, on the North Shore, close to Mosman, North and surrounding Sydney suburbs. If you are interested in finding out more about laser facial resurfacing and whether it would be a suitable procedure for you, we invite you to arrange an appointment with our dermatologist on (02) 9953 9522.